Wally Backman pictured in November when the Mets officially name him Brooklyn Cyclones manager. 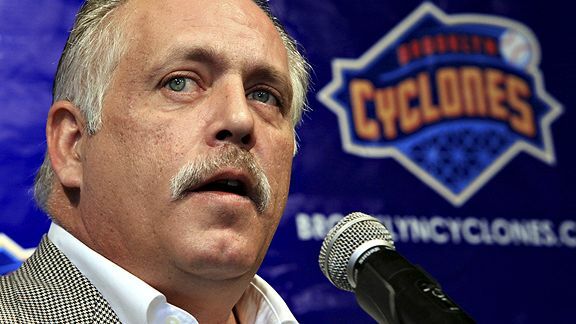 When the Class A Brooklyn Cyclones open their season June 18 at Staten Island, Wally Backman will be managing for an MLB-affiliated team for the first time since his hiring as Arizona Diamondbacks skipper unraveled four days after being named the major league skipper in November 2004. And with Backman’s official return 10 days away, two former pupils now in the majors sang his praises to ESPNNewYork.com. Uggla and Reed both maintained Backman’s fiery side rubs off on his players. Of course, Backman had his share of ejections -- six alone in the season with Lancaster, to go along with two suspensions, the second for 10 games for bumping an umpire. “Well, obviously he’s very passionate with protecting his players,” Uggla said. “I’ll tell you what, if you play for Wally Backman, you’re going to be able to run through a brick wall, because we have the same emotions toward him as he has toward us. I mean, I would have run through a brick wall for him. Everybody is playing hard -- I think playing above their ability -- when they play for a guy like that. Reed praised Backman’s communication skills. Uggla struggled to find a manager who is comparable. “I heard Larry Bowa was very energetic,” Uggla said, trying to find a parallel. “I wouldn’t say Lou Piniella, because I’ve never played for him. I’ve only seen him on the field with arguing calls. No. I wouldn’t say there’s anyone like him. The Mets had a public squabble with Scott Boras in January over whether client Carlos Beltran had permission to have knee surgery. Then, another Boras client, Oliver Perez, refused to go to the minors. And GM Omar Minaya contradicted Boras by saying the agent never asked the Mets to place Perez on the disabled list a month ago and see a sports psychologist, as had been reported. So what did the Mets do Monday night? They selected a Boras client in the first round of the draft: UNC right-hander Matt Harvey from Mystic, Conn.
Boras also represents Mike Pelfrey, who is making $500,000 this season. Pelfrey has three years of arbitration upcoming, beginning this offseason, and won’t be a free agent until after the 2013 season. Minaya’s arrival in September 2004 actually had thawed an ice-cold relationship between the Mets and Boras, stemming from issues including the recruiting of Alex Rodriguez under Steve Phillips. Major League Baseball is awaiting medical records from the Mets regarding Perez. The left-hander, who had been unwilling to go to the minors, abruptly landed on the disabled list Saturday when the Mets activated Jon Niese. Perez suddenly had complained of discomfort with the knee that was surgically repaired last year. He had been dispatched Friday to the Hospital for Special Surgery for an MRI after bringing up the issue. In placing Perez on the DL, the Mets announced Perez had tendinitis. But MLB officials found the circumstances curious enough that they at least want to take a closer look. Still, it’s hard to imagine anything transpiring as the result of the medical records request. Any major league player in his 30s likely has enough wear and tear that can turn up on an MRI to justify a disabled list trip. And, a source noted, it could be difficult for MLB to dispute the findings of a reputable medical facility, such as the Hospital for Special Surgery, which diagnosed an issue, according to the team announcement. An issue could arise, though, if the Mets try to keep Perez on the DL longer than a few weeks with only a tendinitis diagnosis. Had Duaner Sanchez not stepped foot in a taxicab and headed south on Interstate 95 in Miami in the early morning hours of July 31, 2006, the Mets likely never would have crossed paths with Perez , much less signed him to a three-year, $36 million extension through 2011. In the hours before the ’06 trading deadline, the vehicle in which Sanchez was a passenger was struck. The Mets kept the accident quiet long enough to acquire veteran reliever Roberto Hernandez as well as Perez from the Pittsburgh Pirates for outfielder Xavier Nady. The Mets had turned down that deal earlier in the month, but were in a bind because of Sanchez’s loss. Sanchez’s shoulder blade was sticking out as the result of the accident. And, after two surgeries, he still was unable to regain his pre-accident form. He was released by the Mets in spring training in 2009, briefly pitched for the San Diego Padres that season, then was released by them, too. Sanchez, 30, is still trying to get back to the majors. After having wrist surgery last year, Sanchez opened this year by pitching for a month and a half in Mexico. Convinced he would get more exposure for a return to a major league organization in independent baseball in the United States, he agreed to join the Sussex Skyhawks, a Can-Am League team that plays at Skylands Park in Augusta, N.J. He has appeared in four games, and recorded four saves while allowing one hit and no walks in 3 1/3 innings. Sanchez said his velocity, which was way down before getting released by the Mets, was in the low-90s while pitching in Mexico. As for the career-altering taxicab accident, Sanchez said he cannot dwell on it. Washington Nationals flamethrower Stephen Strasburg will make his major league debut against the Pittsburgh Pirates on Tuesday. Right fielder Mike Stanton, the top prospect for the Florida Marlins, is due to be promoted that day, too. And the Mets have confirmed their intention to summon their own rookie: outfielder Jesus Feliciano, who has persevered despite never appearing in a major league game since being drafted in the 36th round in 1997. Outfielder Shawn Gilbert remains the oldest position player to make his major league debut with the Mets. While there have been plenty of Asian pitchers to come to the United States after professional careers elsewhere and debut in their 30s -- plus Cuban defector Raul Valdes this season -- Feliciano will become the second-oldest position player in franchise history to make his major league debut in a Mets uniform. He turned 31 on Sunday. 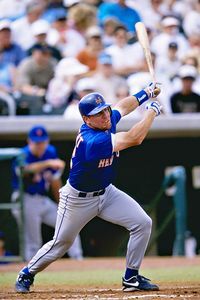 Outfielder Shawn Gilbert made his major league debut with the Mets on June 2, 1997 at age 32 years, 82 days. He appeared in 32 games over two seasons for the Mets, logging only 25 at-bats during that span. He then was traded on June 10, 1998 to the St. Louis Cardinals for outfielder Wayne Kirby. Kirby had 31 at-bats for the Mets the remainder of that season and never played in the majors again. Gilbert had two at-bats in ’98 for the Cardinals, 20 at-bats in 2000 for the Los Angeles Dodgers and then was done with his major league career. “It seems like it’s been so long ago,” said Gilbert, now an assistant baseball coach at Fresno Pacific University, the program that sent Double-A Binghamton pitcher Chris Schwinden to the Mets in the 22nd round in 2008. “I had been playing a lot of games in the minor leagues. In fact, one of the writers had asked me when I got to New York, ‘You’ve played a lot of games, but not very many in the big leagues …” I said, ‘No, this is my first time in the big leagues.’ I had a decent minor league career, and it was just one of those things where I was waiting for that call. The Mets have struggled to explain their disparity between home and road performance. And perhaps their next road trip, to also-rans Baltimore and Cleveland, will be a recipe for closing the gap. As of now, the Mets already are approaching the biggest home/road win differentials in franchise history -- and it’s just a third of the way into the season. 1989 15 51-30 36-45 Dwight Gooden’s 100th win. Seven times in franchise history the Mets had more road wins than home wins.